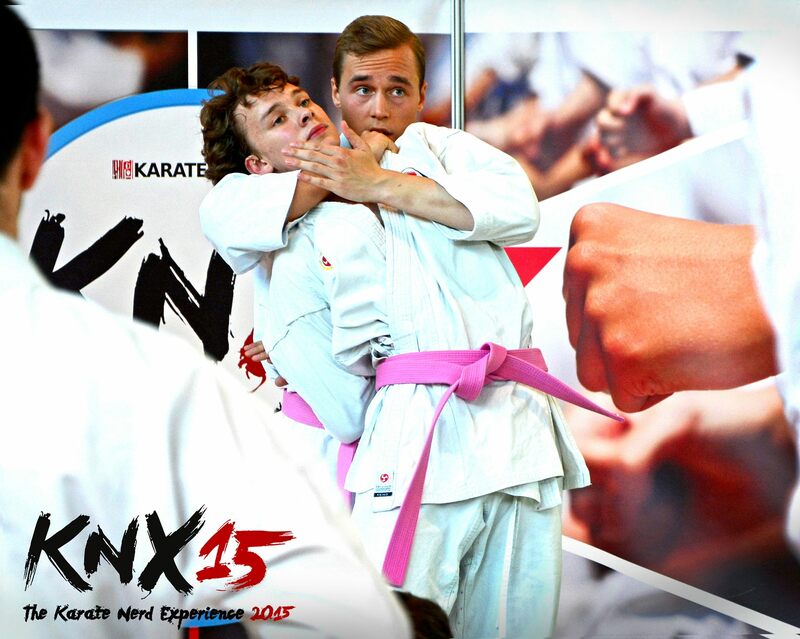 On the second weekend in August I travelled to Frankfurt along with other martial artists from around the globe to enjoy Jesse Enkamp’s second Karate Nerd Experience – KNX 15. 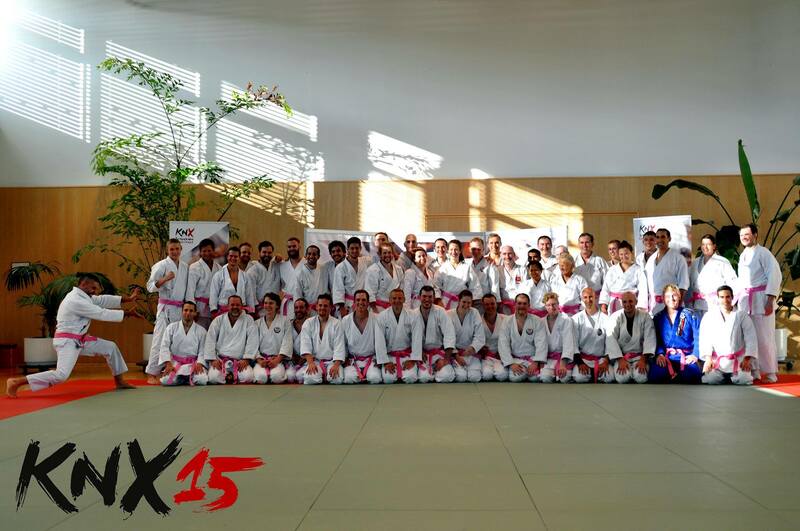 Attendees and instructors came together from North and South America, Europe, Africa and Okinawa to share their enthusiasm and knowledge in the beautiful facilities of the Frankfurt Sports Complex. 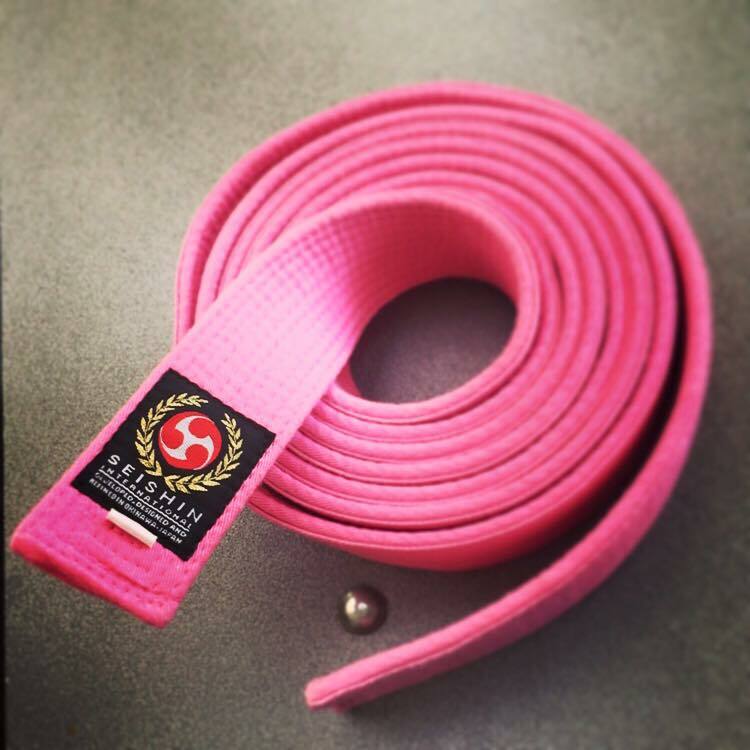 The momo-iro obi – more than just a belt. Before I say anything about the instructors I’d like to make a comment on my fellow participants. I’ve seen a number of things written about the momo-iro (peach blossom) belt that is one of the signature elements of this event. From adults just out of college to a number of us with greyer hair and beards, throughout the event I had no idea of the grades or experience of my fellow participants. Grade was not relevant. What was relevant was an enthusiasm to learn, a clear respect for every other person on the mat, and the willingness to try new approaches. 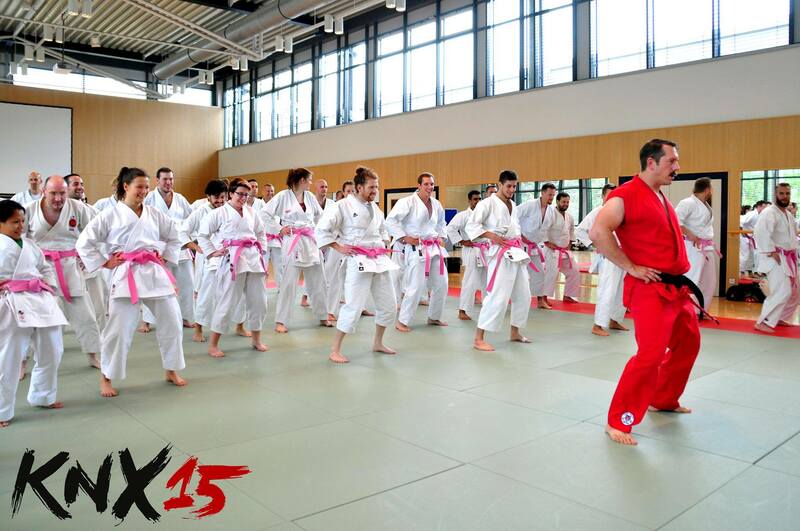 The belt was worn not only by the students but also by all the guest instructors. The momo-iro obi not only bound our waists, it brought us all together as a symbol of shared experience. So what was this experience? I’ve been fortunate enough over the years to have attended and taught at a number of national and international seminars at home in Britain and abroad, both in single disciplines such as karate or multiple martial arts. Without a doubt, forgetting for a moment the high quality of the instruction, this was the smoothest running event I have ever seen. Much of the credit for this is due to Jesse Enkamp and the team that he gathered together to run the seminar, particularly Matthias Golinski. From picking a good venue (with accommodation, training and social facilities all in the same building) and organising appropriate instructors, timetabling events and arranging video recording and cameras, communicating in advance and throughout the experience by email and social media, to welcoming us all with a goodie bag – everything slotted perfectly into place. For those of you that have read Jesse’s blog this attention to detail should come as no surprise. Jesse kicked off the event by bringing us all together for a training session on four bunkai he had developed for a kata that was immediately identifiable to me (though a version from a system I had never practiced). This session and Jesse’s instruction set the tone for the entire weekend. Jesse is a superb technician and an inspiring teacher. Most people know Jesse through his Karate Nerd blog as a successful competitor, and a good writer and researcher; as Jesse starts to teach more seminars I hope that more people will discover what a good teacher he is too. Jesse was followed onto the mats by Swedish BJJ instructor Waldo Zapata from Viva Zapata BJJ . This was another lesson marked by good humour, training insights and high quality teaching. Imagine the challenge of teaching a number of ‘get-up’ drills to a class where the majority had little or no ground experience. It was a tough challenge, but the principles were explained clearly and movements broken down in such a way that the group progressed at a fast pace encouraged by Waldo’s enthusiasm. Happy students at the end of the class. The first evening began with a question and answer session with Okinawan Karate legend Hokama Tetsuhiro, 10th dan. Hokama Sensei was engaging and enthusiastic as he tackled the various questions the group put to him (and he was later interviewed by Jesse Enkamp for Jesse’s blog). Hokama Sensei kindly finished the evening by demonstrating his calligraphy skills, writing kanji for attendees on specially provided paper as well as signing copies of his latest book. Hokama Sensei taught three lessons on Saturday aided by two Uke and demonstrations from the attendees where he was impressed by their training. His lessons were marked by concentration, attention to detail, physical pressure and giggles. 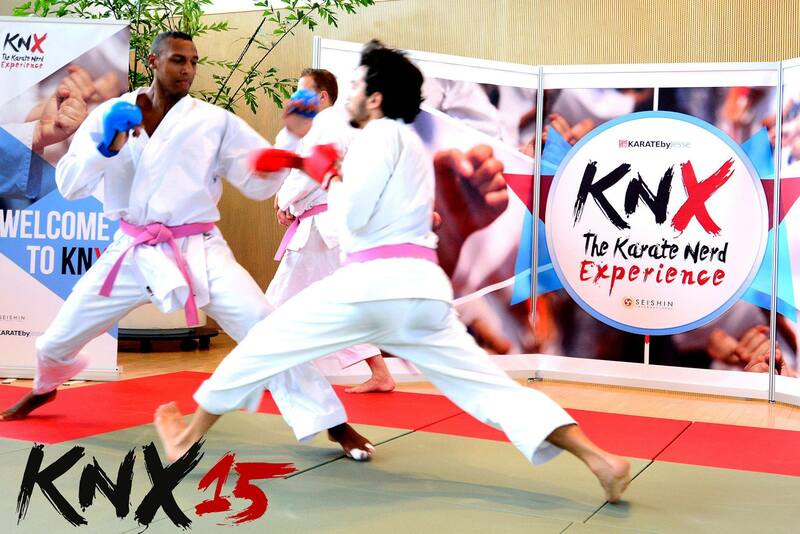 The combination of concentration, relaxation, hard conditioning (varying throughout the group depending on age and injuries) and laughter summed up what makes karate so appealing as a hobby, a form of exercise, and as a way of life. 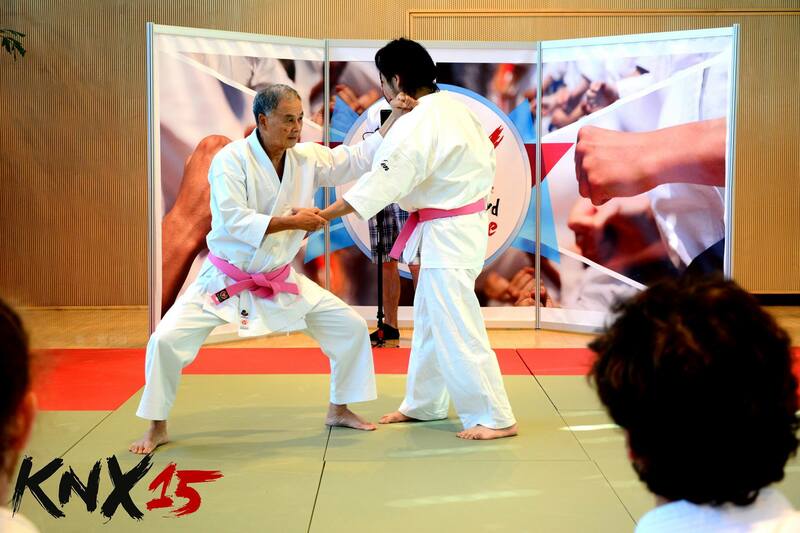 In the middle of Sensei Hokama’s lessons the participants took a break from Okinawan karate to look at the dynamics of modern WKF competition karate under the tutelage of World Kumite Champion Jonathan Horne. Due to pain from a pre-existing back injury I sat and watched this lesson, which focused on understanding distancing, generating speed, using appropriate timing, and the economy of movement. A composed Jonathan Horne giving a great demonstration of timing, distancing and economy of movement. Karate is so broad that it can be easy to put ourselves into ‘camps’ or ‘factions’ and competitive karate is not my forte, but watching Jonathan teach I was able to identify principles of movement and posture that I have discussed elsewhere on my blog as well as other commonalities with lessons taught by Jesse Enkamp, Waldo Zapata and Hokama Tetsuhiro. 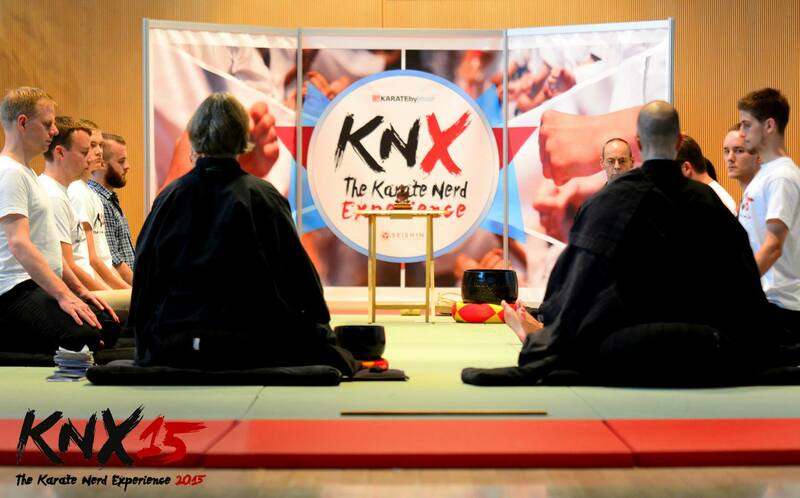 Although not the most physically demanding of the KNX sessions this was indubitably the most energetic and tiring, but the atmosphere created in the dojo meant that it was impossible to find a single person without a beaming smile while watching Jonathan demonstrate and teach. On Saturday evening, as we gathered back at the dojo for the evening’s ‘secret’ activity, the group was still buzzing. Jesse had realised that we might be a combination of high spirits and tired bodies and had organised an introduction to meditation. Suitably calmed and rested we all took advantage of the excellent social facilities to sit outside in the evening heat to informally discuss the day’s events over some nourishing cold beverages. Before we knew it Sunday morning had come round and it was time for Jesse to deliver the final lessons. Jesse began by encouraging us to practice the combinations he had taught us on Friday before showing us how they related to the Ryuei-Ryu version of the kata Niseishi and teaching us the full solo form. As someone who knows two other versions of this form I found this lesson particularly fascinating. This session once again highlighted the quality of Jesse’s instruction and the precision of his techniques. It was also fascinating to see the slight variations in the performance of the same form caused by the different heritage of the various participants. One last class remained. In a very prescient manner Jesse had scheduled a ‘recovery’ class to look at post training exercises to optimize recovery and therefore enhance our potential. This is a subject that is often ignored and it was good to see it covered as part of a more holistic approach to karate training. While I am certain that there was more Jesse could have taught us, at that point the Dojo was stormed and taken over by another Master. As we had failed to heed his warnings, travelling all the way from New Mexico, Ameri-Do-Te 11th Dan Master Ken strode into the Dojo to teach us the error of our ways. 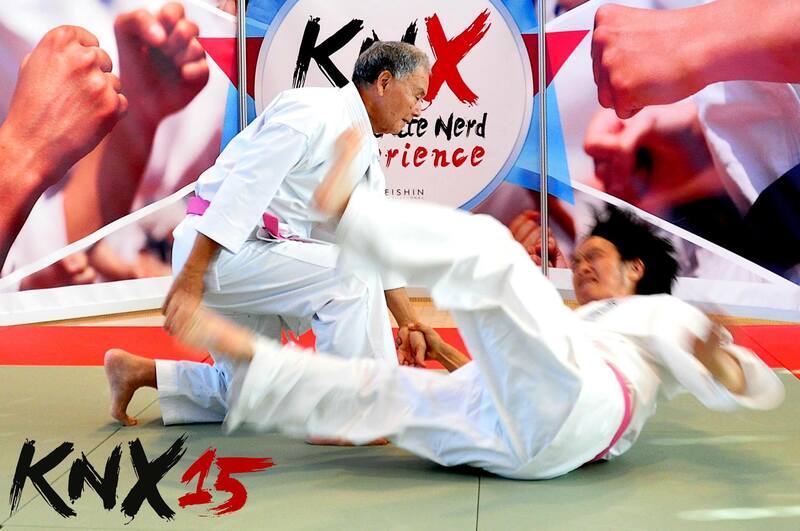 Clearly outranking the ‘pink’ belts of the event organisers, Master Ken was quick to take control. Matthias Golinski, Master Ken, Jesse Enkamp. This was truly a unique ending to a great weekend seminar. Master Ken was as incredible in person as his youtube channel Enter the Dojo suggests. After a quarter century of training in karate, I was humbled by the power and charisma of a one man hurticane. Learning the Thrust of Freedom. Watching this man shook me to my core. My sides are still aching. There were moments when along with my companions I was helpless on the floor. 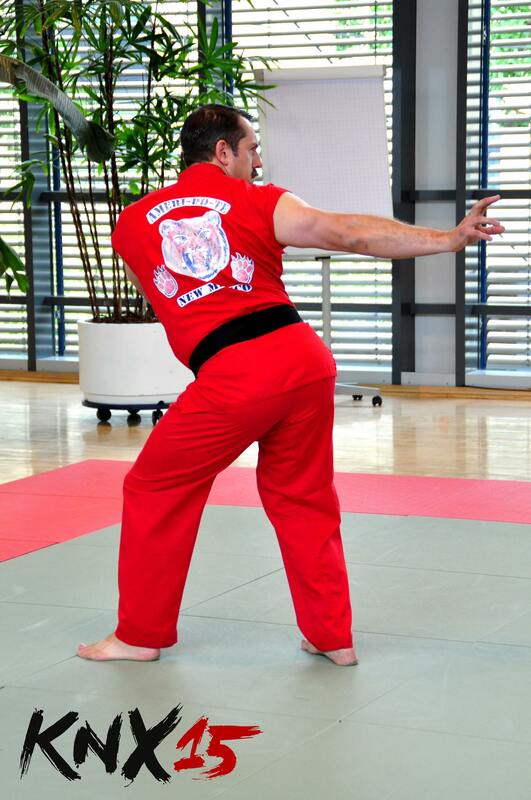 Master Ken demonstrating one of the unique moves of Ameri-Do-Te. Reflecting on the weekend I can see that it has stoked the enthusiasm of all the attendees and proved the flash point of a number of ideas that will be taken to dojos across the world. The only sad thing is that we could only meet up for a weekend. I would jump at the opportunity to train with any of the instructors who were chosen to teach, and would recommend training with any of them if you have the opportunity to go to a seminar or visit their dojos. Most of the instructors are based in Europe, America or Asia but KNX organiser Jesse is visiting the UK later this year. 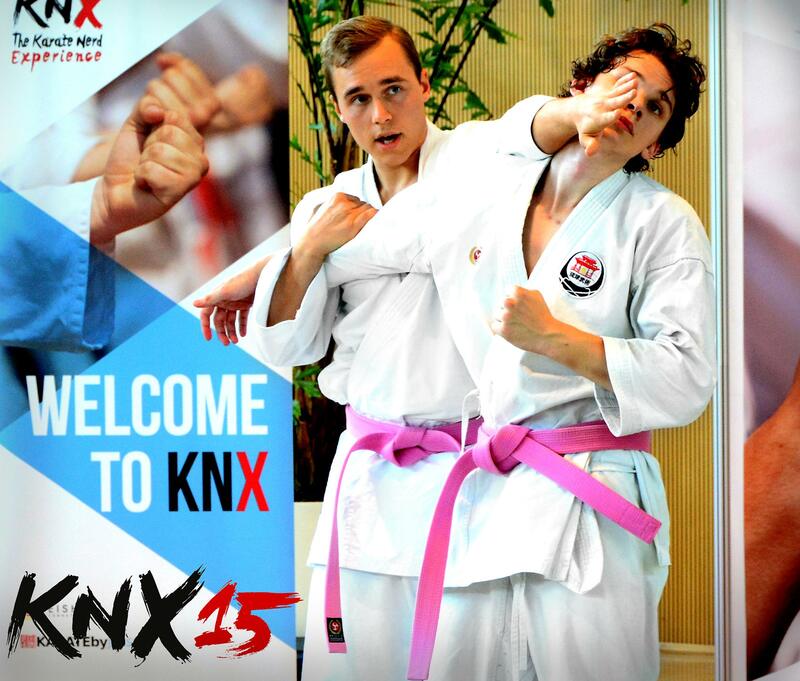 Thanks to Jesse, the team and everyone else at KNX15 for a great event. I am already looking forward to seeing what the next one will be.